The following is a journal entry submitted by Australian Laser Masters sailor Frant Bucek who ventured to Fiji with his Laser, on his Beneteau, Anaconda Australia. When Ken Hurling Australia & Oceania Laser Association chairman announced at the Maloolabah Australian Masters Championships, that the inaugural Oceania Masters championships would be held in Fiji in October 2018, I made a snap decision to be there in a tropical climate rather than brave the chill of Ireland. To carry my Laser there as deck cargo on my Beneteau First 44.7 seemed like a logical progression. 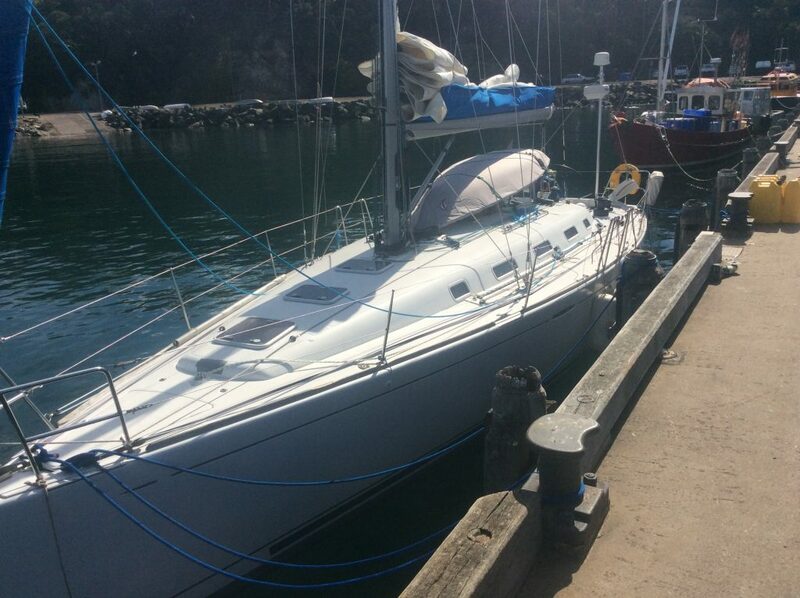 I fabricated cardboard cutouts of a Laser to test-fit racks to mount the Laser on the coach house, and made a 30-nautical-mile sea trial from my home port of Geelong to the Sorrento Sailing Couta Boat Club for the mid-winter regatta. 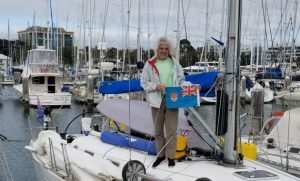 My original plan had been to sail to Fiji via Minerva Reefs, a coral atoll halfway between New Zealand and Tonga, launch, and sail the Laser in the most remote location possible. Unfortunately, my sister passed away after a battle with cancer and my departure date was delayed. Rather than a leisurely cruise to Fiji via this tropical atoll, the trip became a race against time. Thus, the concept of a shorthanded ocean race evolved. The passage to Fiji was pretty exhilarating with the first few days rugged up in full, wet weather gear, close-reaching in 30–35 knots with a maximum of 48 that we saw, while sorting out minor glitches on a heaving foredeck in the middle of the night. The Laser proved to be a fine spray-dodger in these conditions. Several days later, we could truly tick the tropical when the rugged volcanic peak of Matthew Isle appeared on the horizon. 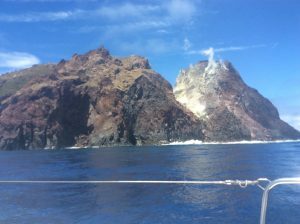 Our thoughts of anchoring in a tropical paradise were curtailed when we observed the waves pounding against shear volcanic cliffs, and the sulfurous smoke rising from a cleft in what appears to be an active volcano. It was truly an awesome sight. The wind died as we passed to leeward of Matthew Isle giving us 36 hours to delight in a thumping diesel and wildly rolling boat. 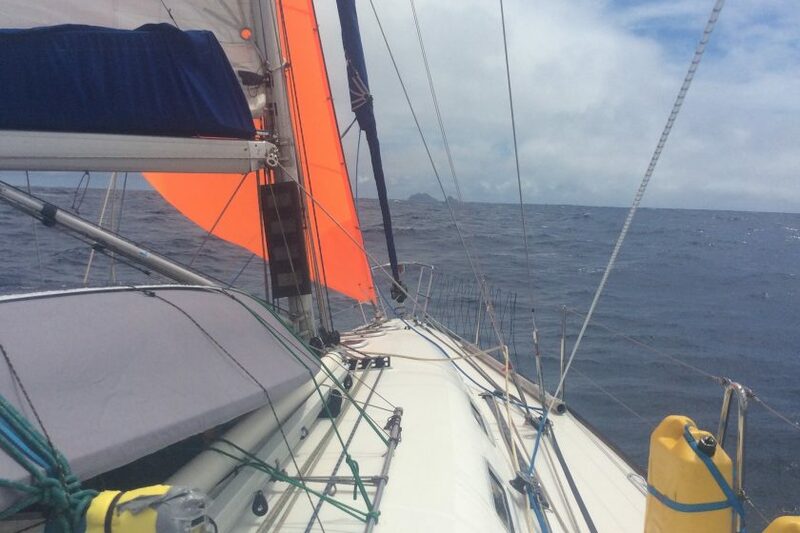 With some 200 nautical miles to Fiji, the wind had returned. Just before dawn, some 20 nautical miles from Fiji, I was woken by the wildly flogging sails and a tack to port as the autopilot switched to standby rather than respond to a course trim. I leapt from my bunk, donning my life jacket as I made my way to the cockpit to take the wheel and assist bringing the boat back under control. My co-crew and navigator left me alone and went below to set our course and replace some batteries. I stood there at the wheel, the sun rising on the October morning, entering Fiji territorial waters. Anaconda Australia docked at the Port Denarau Marina at 11:06, completed inbound customs clearance around 13:00, lowered the quarantine flag, and hoisted the Fiji courtesy flag to the starboard spreader. We had arrived in Fiji. A total distance of some 1,850 nautical miles in 10.5 days. The inaugural Fiji Oceania Laser Masters Championships will take place October 13–26, 2018. Lasers will launch from the beach of the Sofitel Fiji Resort and Spa, and the Laser Masters will race on the waters edging Denarau Island, Fiji.